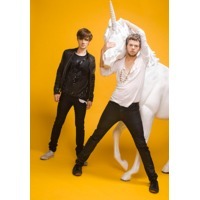 Pnau is an Australian dance music duo originating from Sydney, Australia. The duo consists of musicians Nick Littlemore (vocals, production) and Peter Mayes (guitar, production). The pair have achieved multiple successes throughout their career with their award-winning debut album Sambanova, their universally acclaimed 2008 release Pnau, their breakthrough side-project Empire of the Sun, and their multiple chart-topping singles. Pnau is also recognized for their heavily publicized apprenticeship under musician Elton John, who signed the duo after listening to their record Pnau. A number of projects featuring Elton's involvement with the band are currently in development, such as Pnau's new album Soft Universe and an album featuring Pnau recreations of Elton John's hits.